My first experience with a glass nail file was very short-lived and ended abruptly when I accidentally stepped on it - don't ask! The ensuing mess meant I had to buy new bedroom slippers, and I've never really found a pair as comfortable as my froggie pair. Thankfully, the file itself was plain. This time around, the journey is far easier. For one, the nail files I'm showing you today are absolute beauties, so I'm more careful. 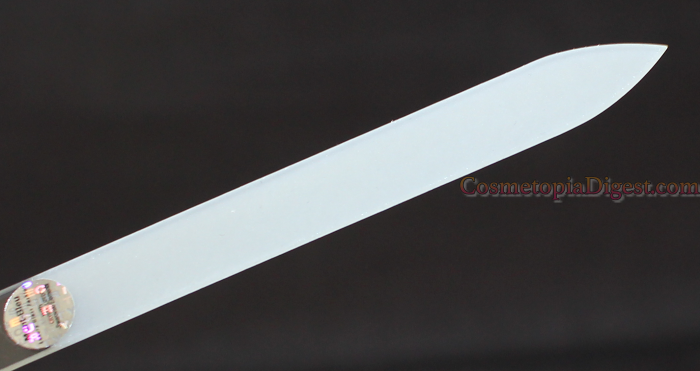 Secondly, each Czech glass file comes in an individual slip-case. I've already dropped these a couple of times and they've held! Finally, these are so much kinder to my already-brittle nails than steel files. 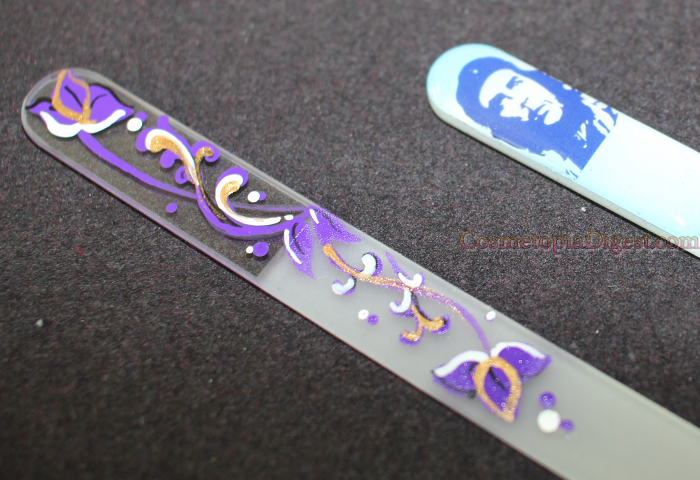 Mont Bleu Files are made with the famous Bohemian glass, and are decorated with precious metals, handpainting, and Swarovski crystals. They are crafted in Prague with fine-tempered glass. 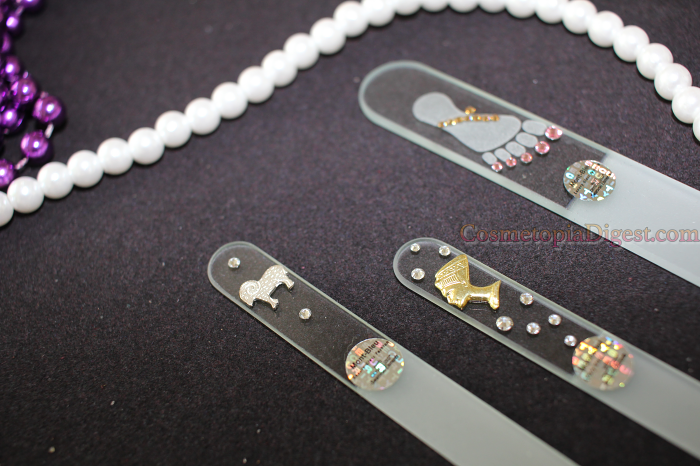 Scroll down for a closer look at the Mont Bleu Glass Nail Files. Mont Bleu has been around since 2002. They also manufacture for private labels. Each file comes in a protective velvet pouch, which withstands being dropped - no, really. Sizes of the files vary from regular (13.5cm) to large (19.5cm), and each file is 3mm thick. For more information about the company, go here. The glass is very fine and non-abrasive on the skin. I love that my nails haven't peeled after I began using glass files. I also used the Aries file to get rid of a hangnail. These are easy to clean with soap and water, and the surface does not clog up with use. Best of all, Mont Bleu claims that the glass is designed not to shatter, but will only break evenly with no sharp ends. I refuse to try that out on purpose. Let's take a closer look at the files. 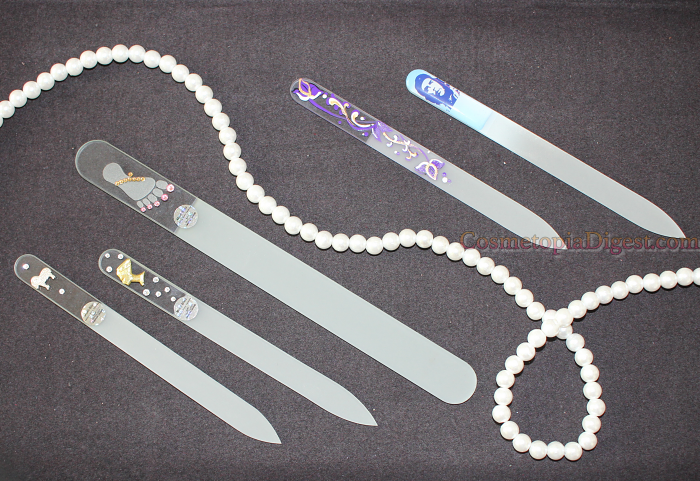 This luxury edition file is suitable for both manicures and pedicures, and is 7.68'' long. 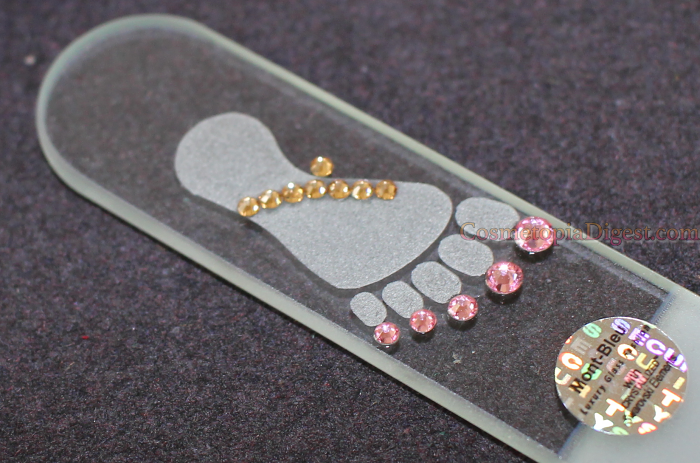 The foot has been "sandblasted", and is decorated with Swarovski crystals. It costs €14.50. 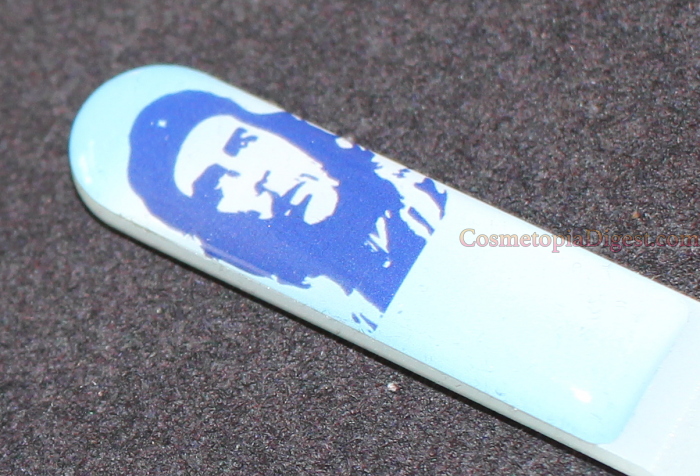 This is an "3D" file, with a 3D-effect sticker of good ol' Ernesto - they had animal prints, pop icons (Elvis, Enrique Iglesias, Elton John, MJ, the Beatles et al) and Che. Having grown up in what is known as the "last Marxist bastion", I picked the latter. 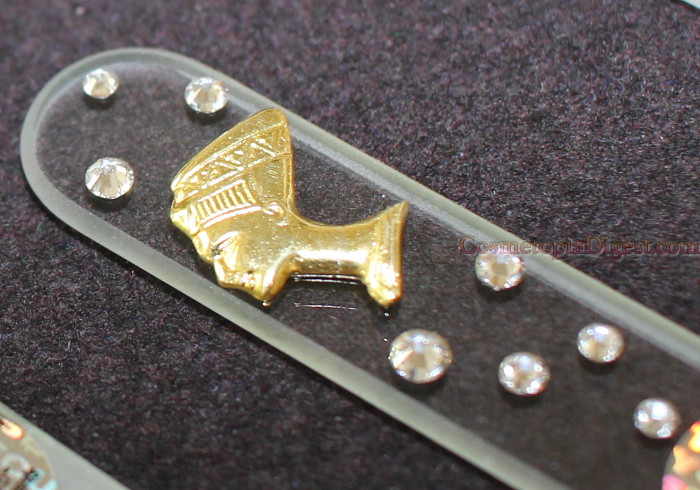 The jewellery line has gold-plated bronze or silver figurines, decorated with Swarovski elements. 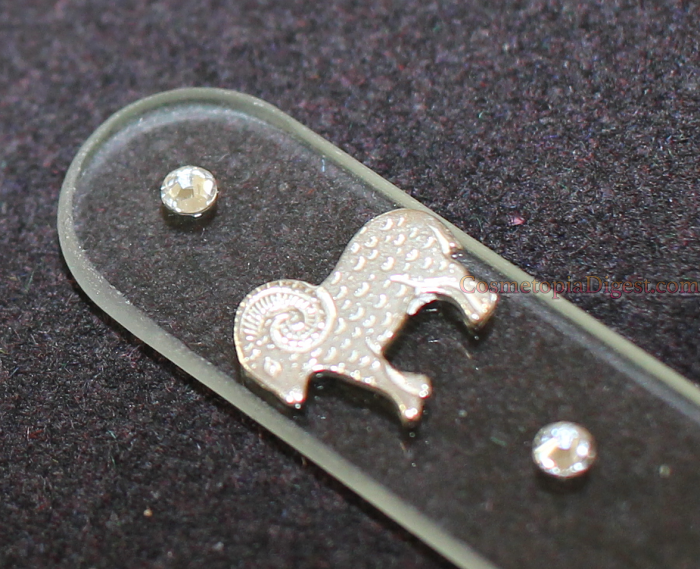 The range includes cute cats and butterflies, and semi-precious zodiac stones. I cannot get over how absolutely beautiful these are. Plus, the presentation and design make these withstand breakage upon being dropped - something very important to a klutz like me. And, my nails are loving the results. My biggest gripe is just that - these are so pretty that I want to put them away carefully rather than use them! Mont Bleu also has more sombre monochrome and decor-free files. They also have makeup brushes, tweezers, scissors, and hair accessories and jewellery. They ship worldwide from here. I have a 20% off voucher for you - not an affiliate code - just use the code BLOG at checkout. Mont Bleu also has an Amazon shop here. 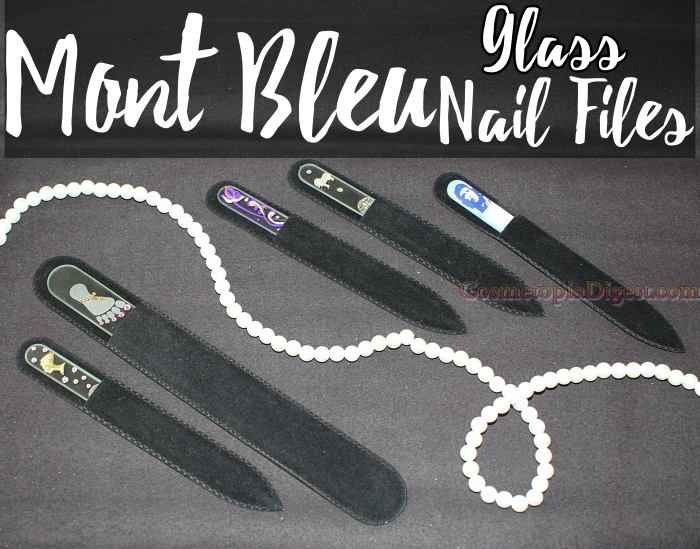 Have you ever tried a glass nail file? Do you prefer it to emery/steel files? Tell me in the comments widget below.